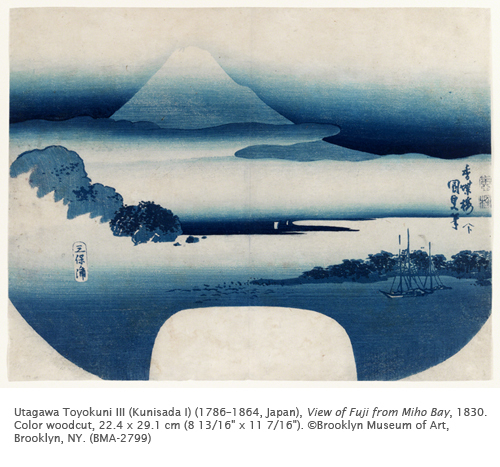 Aizuri-e means “blue printed picture.” Traditionally, the blue was derived from the dayflower. However, via the Dutch in Osaka, Prussian blue was imported from Europe as early as the 1790s. It did not appear in woodblock prints until the 1810s. By 1829 it is visible in several artists’ work. Having dabbled in woodblock prints, I find the nuances in the values of the blue to be extraordinary. Looking at landscapes such as this, it’s hard to believe that the artist was better known for his actor and courtesan prints! 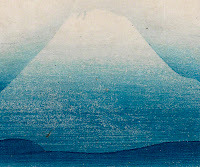 If one did not have an eye for the grain of the wood (visible in the pale blue on Fuji), this could easily be mistaken for a painting. Utagawa Toyokuni III (Kunisada I) was in his own time was the most popular and successful print designer in Japan, ahead of Hokusai and Hiroshige. He was born in Edo in 1786, and his was an amateur poet of some note. After showing a predisposition for art (copying prints of actors), he was accepted as an apprentice around 1800 by one of the great masters of the Japanese woodblock print, Utagawa Toyokuni (I) (1769–1825), and became one of his chief pupils. Kunisada started out doing actor prints, the initial specialty of the Utagawa school, but eventually branched out into prints of beauties, and even dabbled in landscapes. The Utagawa school was the most prolific of the ukiyo-e (ca. mid-18th to mid-19th centuries), founded by Utagawa Toyoharu (1735–1814). Toyoharu became most famous for landscapes done in Western-influenced one-point perspective. Although Kunisada’s landscapes (in the 1830's) showed real promise, he never did many. This work comes from a series of designs for fans, and is in the traditional layered recession. Fan-shaped prints became a popular during the Edo period. Since they were often cut and glued to fans, few of these designs have survived. Kunisada excelled at fan-shaped prints and designed works that capitalized on the unusual shape. He produced relatively few landscape designs during his career, and this one is particularly unusual for its avoidance of outlines.